Over the course of the last six years, students in grade 8 haven’t shown much progress in advancing their arts skills. Fewer eighth-graders are taking music and visual arts classes and those who participate in outside classes are dwindling in number. Lower participation may be one reason that national scores for arts achievement have dropped several points. Average scores are mixed among Hispanic students, however, as well as female and male students and regionally across the country. The arts assessment measured knowledge and skills in the disciplines of visual arts and music. Students were “assessed separately on responding to existing works of music and visual art and creating their own original artwork,” according to the report. "Responding" questions, or ones that tested comprehension, are reported on a scale of 0 to 300 for both the music and visual arts portions, and 0 to 100 for the creating task score in the visual arts portion. Identify the region or origin or social context of a music excerpt. 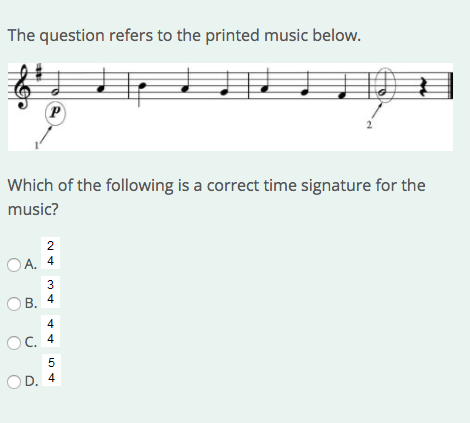 One multiple choice question, for example, asked students to identify the correct time signature for a piece of music. Image: NAEP. Overall, the average responding score for students in grade 8 dropped from 150 in 2008 to 147 in 2016. Based on the data, students had an easy time identifying sounds produced by various instruments, with higher scores for these types of questions. However, students struggled with composition skills like musical notation. For instance, students with an average score of 300 had trouble identifying the term for a fermata symbol and identifying the pitch for a piece of music (scoring 187 and 181 on average for these questions respectively). The music portion also had one “creating” question, which “asked students to use music notation to write an ending to a rhythmic pattern,” according to the report. Ability to create original artwork, including a self-portrait. Students drew self-portraits for the "creating" question in the visual arts portion. Image: NAEP. Students were asked, for example, to analyze the aesthetic properties of two self-portraits from 20th century artists, Käthe Kollwitz and Egon Schiele, and to identify technical similarities between the pieces. Overall, the average responding score for students in grade 8 dropped a point from 150 in 2008 to 149 in 2016. Students at the 25th percentile and the 10th percentile (the lowest performers) were the only ones to show improvement since 2008. Again, the visual arts data suggest that students can provide perceptive, specific commentary on works of art. They are also good at finding a connection between an artist’s technical approach and the meaning of a self-portrait (scoring 239 on average). They have difficulty with more arts history-specific questions, like identifying an example of Renaissance art (scoring 192 on average) or Western art (scoring 187). Regionally, students in the Northeast outperformed students in all other regions of the United States in music and visual arts, while the South had the lowest average scores in visual arts and the West in music. When race/ethnicity is considered, White students’ average scores in music dropped from 161 to 158, while Hispanic students’ average scores increased from 129 to 135. White students also had slightly lower average scores in visual arts (from 160 to 158), while Hispanic students improved (134 to 139). Female students scored higher on average than their male peers. In music, female students scored 155, or 15 points higher than male students (140). In visual arts, female students scored 14 points higher in visual arts. Meanwhile, students in suburban schools scored higher on average than students in city schools, with a 13-point lead in music and an eight-point lead in visual arts. For students enrolled in the National School Lunch Program, average scores were 26 points lower in music and 22 points lower in visual arts compared to students not eligible for the program. Private school students scored higher on average than those in public schools. The former scored on average 14 points higher in music and 16 points higher in visual arts compared to students at public schools. To view or download the full report, visit the NAEP site.